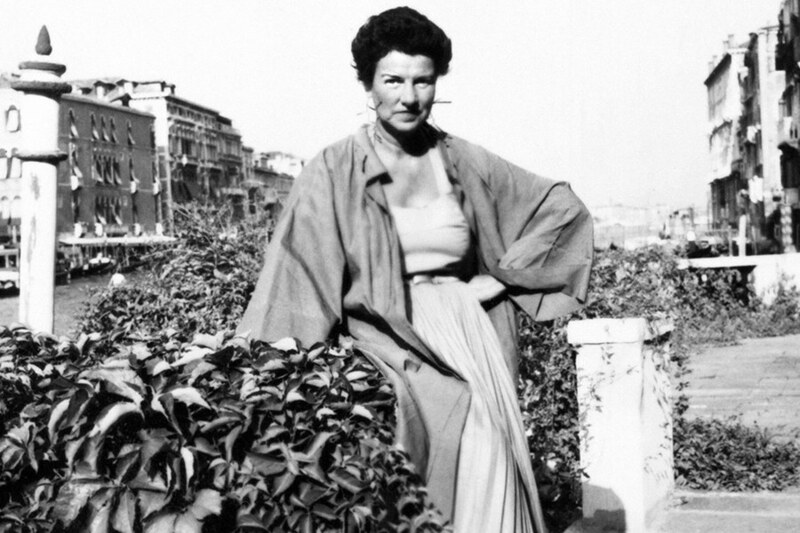 As we enter high auction season where the focus of the art world is squarely on the dollar, there is the perfect antidote: a new film biography of Peggy Guggenheim: Art Addict. The film is straightforward but the subject is decidedly not. Peggy -- as she seems to have been known to one and all, and which helpfully distinguishes her from her more imposing and severe relatives -- was a direct descendant of two storied Jewish families: the Seligmans who had made their fortune in banking (and who were the earlier, therefore more snobby side), and the Gugggenheims who had been in mining in Pennsylvania. Peggy refers to her childhood as "gilt edged" in her wry and delightful "Confessions" which are perhaps even more eye-opening, and certainly more comprehensive than the film is able to be, (and which I highly recommend). The Seligmans had the eccentrics and the Guggenheims had the power brokers and Peggy seems to have inherited a healthy soupcon of both. 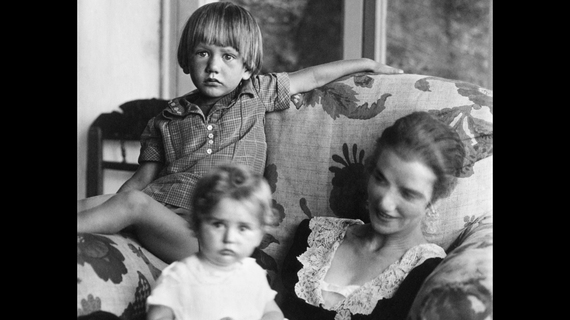 She was a rebel, the black sheep, an heiress but not nearly as rich as her Uncle Solomon who began the Guggenheim Museum, and who, along with the rest of the family, was hugely embarrassed by what they saw as a penchant for commerce and lifelong goings-on. "I think I surprised them," she writes, modestly. There are tragedies galore: Her adored father -- who began to have mistresses when she was five or six -- drowned on the Titanic while his "secretary-mistress" survived. Her first husband left her with their two children one of whom ended up bipolar and killed herself. 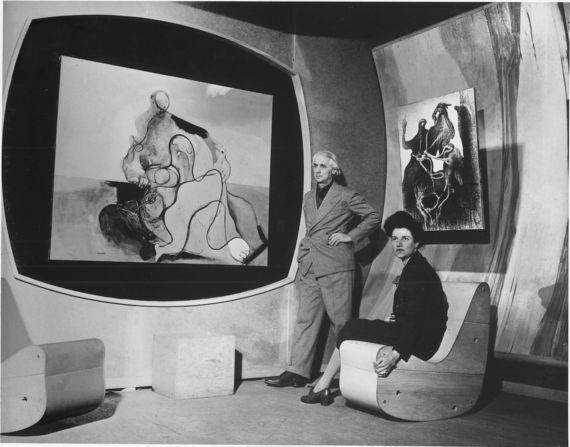 Husband three, the artist Max Ernst used her to get a green card and as a meal ticket and then ran off with Dorothea Tanning. Her niece and nephew died mysteriously from the top of the Surrey hotel. As a self-described nyphomaniac, she had by her own account many, many abortions. Filmmaker Lisa Immordino Vreeland helpfully divides the life into distinct periods which echo Peggy's memoir: the youthful rebel who understood she was not beautiful and who had no protectors and knew she must make her own way; the young woman who sailed for England and opened her first gallery with a small inheritance after her mother's death; the short stay in Paris-where she was able to pick up a top drawer collection for 40,000$ as the artists and dealers were in flight from the looming war; the glorious period of her New York gallery Art of This Century; the return to Europe and Venice where she lived out the rest of her long and colorful life amidst the villa she used as home and gallery for her collection. Vreeland ropes in a too long list of one-off quotes from a variety of biographers, former friends and hangers-on, dealers, museum directors etc not all of whom are equally vested in the mythmaking or scholarship of Peggy Guggenheim and some of whom she would surely have scorned. 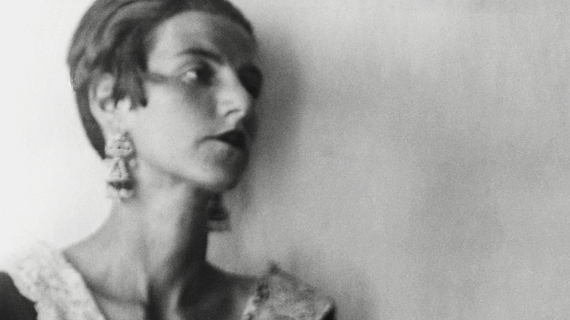 But the discovery in the basement of a long audiotape of an interview her first biographer Jacqueline Weld did with Guggenheim provides Vreeland the vivid first person spine she needed, and along with some short clips of her and a lot of stock footage, she is able to bring her subject to tragic life. The sound of her voice, the faux upper crust accent she was taught at school, is at odds with her sometimes extraordinarily painful recollections, as if she were talking in the third person. Art historian Dore Ashton said she didn't realize people were taking such advantage of her. She was the subject of "ridicule and disparagement", said Lisa Phillips, director of the New Museum "but it didn't seem to bother her." The voice-over belies this: I think she understood, and repeatedly allowed, this imbalance precisely because she felt so lonely and dispirited when she was not surrounded by artists, not just in the pack, but ahead of it. I think it was the price she felt she had to pay for not being beautiful and charming. Vreeland paints a picture of a woman who on the outside may have appeared strong and decisive but who on the inside was a mass of needy jelly. The crux of Peggy's malaise, besides her "excessively unhappy" childhood and "complex about no longer being a real Guggenheim" were also residuals of how unattractive she felt. She could not rely on her looks to deliver a husband or a life. She tried to have her nose fixed early on, at 22, and it was botched -- but she left it that way. She used Lawrence Vail, her first husband, "to get rid of my virginity" a year later. But the notion of needing attention from men, especially important, intelligent -- as she says, tall handsome men -- was the through line for much of her personal and professional life. She collected these men, artists and writers, as much as she collected their art and advice. Her canniness was in identifying those who could help her achieve prominence -- and the best collection -- in the most substantive and lasting way. 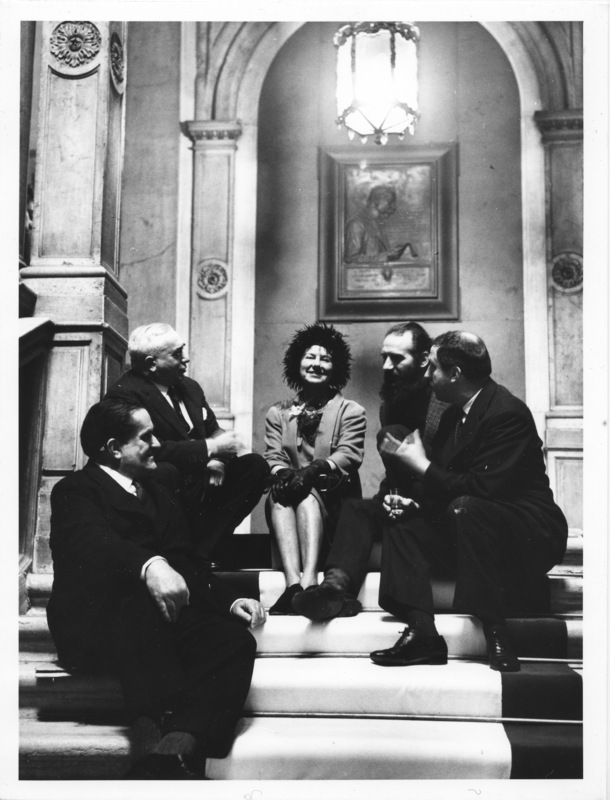 Peggy Guggenheim at Palazzo Venier dei Leoni with Alexander Calder, Arc of Petals (1941, PGC), Venice, early 1950s. Solomon R. Guggenheim Foundation. Photo Archivio CameraphotoEpoche. Gift, Cassa di Risparmio di Venezia, 2005. Behind her Jean Arp, Overturned Blue Shoe with Two Heels Under a Black Vault (1925, PGC). 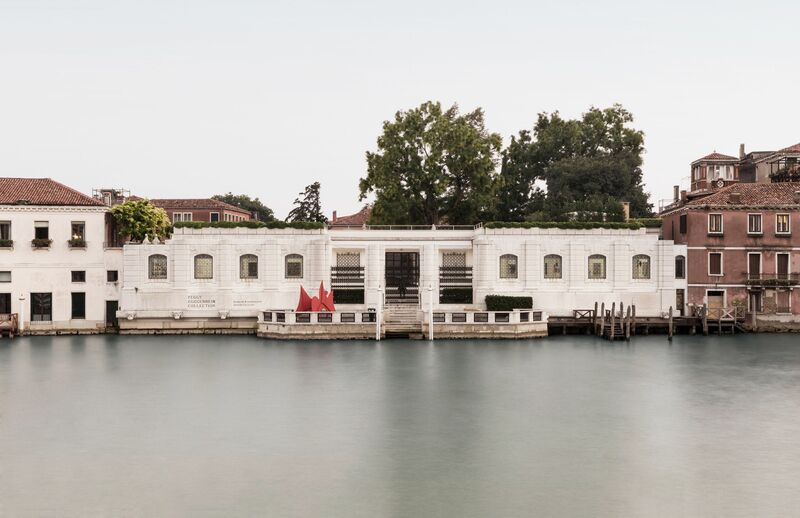 The Venetian era is the one that now defines her because the collection is housed there in the once rundown villa she purchased but in fact the earlier London, Paris and especially the New York gallery periods represent the most courageous periods of collecting. This is the great value of the documentary, to bring these earlier periods to the forefront, thereby demonstrating just how savvy she was. Peggy says Marcel Duchamp, the great up-ender of 20th century art theory, taught her everything she knew about art. She became one of his most devoted pupils but also one of his most ingenious readymades -- left precisely as she was, but delivered to the world in an entirely new context. 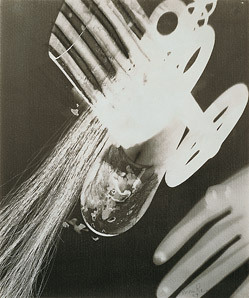 Duchamp seems to have been kinder to her than most, a father figure not a lover. "I don't know what I would have done without him", she wrote. 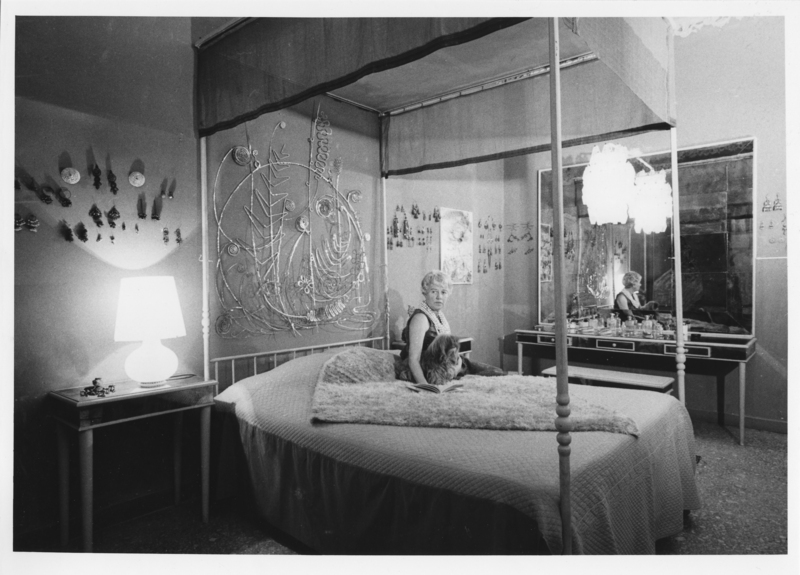 She also got advice -- and bedroom time -- from Tanguy, Ernst, Brancusi. She knew she was not intellectual. But as a very good listener and reader, she was able to educate herself in a most distinguished manner. 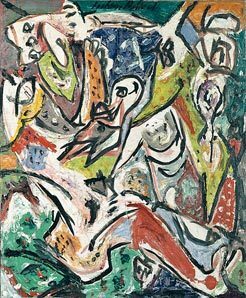 She married twice in England -- Vail gave her two children, her second husband died after a botched surgery -- but her London gallery, Guggenheim Jeune, while it showed Kandinsky and Tanguy for the first time, was challenged by preparations for the war. She fell in love with Samuel Beckett and started commuting to Paris, eventually moving there as the war came ever closer to London. Her collection flourished as she was able to pick up a lot of wonderful works: artists were needy and many important Jewish dealers needed to cash out and flee on the eve of the war. 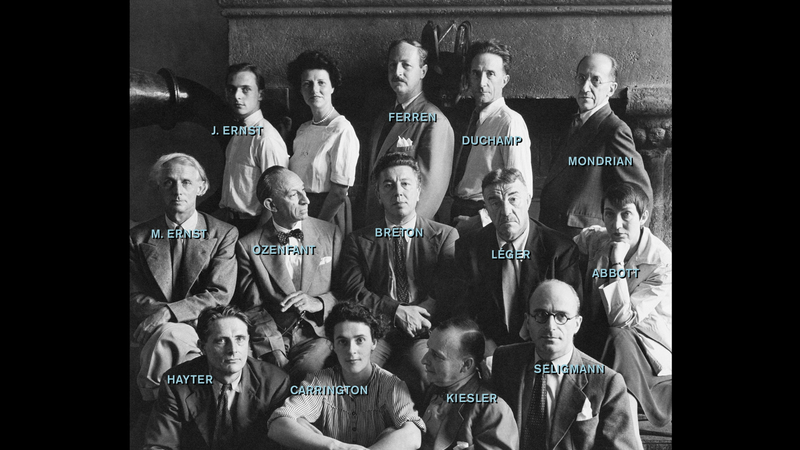 More liaisons with -- and purchases from -- artists like Brancusi followed. Her goal was to acquire a painting a day. The problem continued to be: where would they be safe from the Germans? After aborted attempts at storing the work in Grenoble and the south of France, she left for New York. Her works followed her in a container ship marked as household goods. She arrived along with so many émigré artists fleeing the war that the entire center of the art world shifted to New York. Her relationship with the New York school of artists was slightly different. With advice from Ernst and Andre Breton, she added to her collection and published a catalogue of her work which coincided with the opening of her gallery of the same name, Art of This Century, "very theatrical and extremely original", designed by an imperious architect who was a friend of Duchamp's, Frederick Kreisler, who wanted the architecture to outshine the art (sound familiar??) The paintings were left unframed, the floor was painted turquoise. 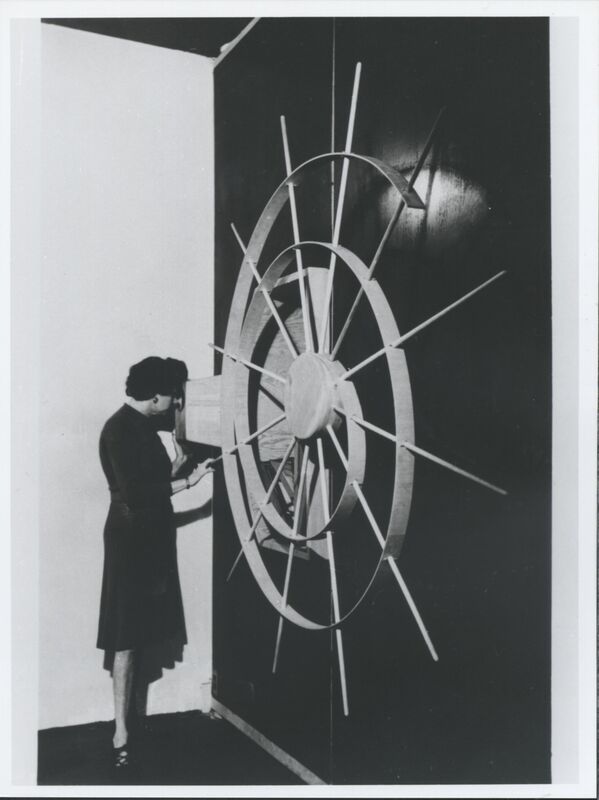 Guggenheim may have been the first to understand that her gallery space was as important as the artwork it displayed. A clip from a film by Maya Deren gives an idea of what the experience of the space was like, and is beautiful and haunting.She wore one Tanguy earring and one Calder earring to the opening to show her loyalties to both Surrealism and Abstraction. 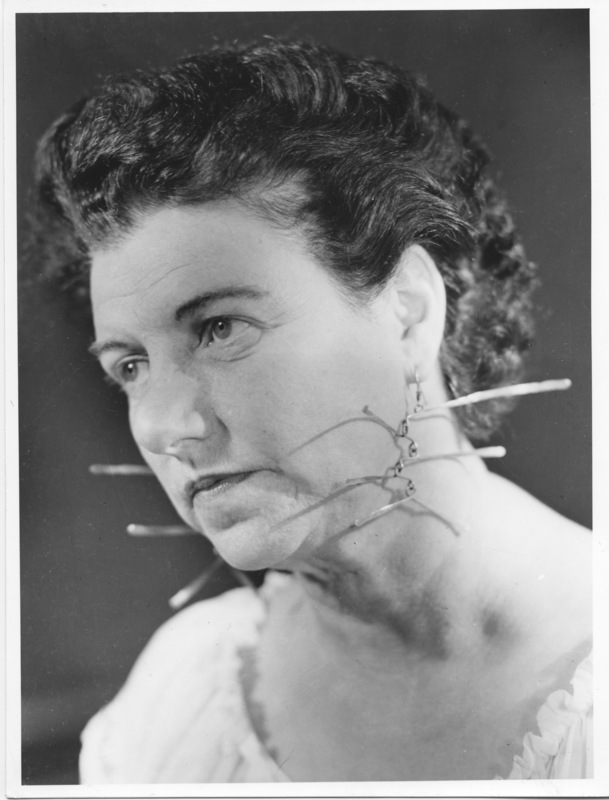 Peggy Guggenheim wearing a pair of earrings made for her by Yves Tanguy; 1950s. 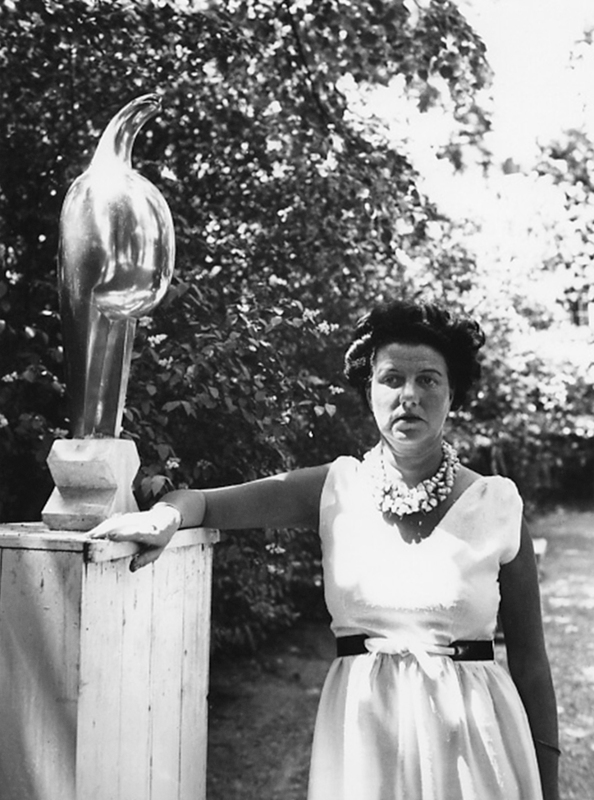 Peggy Guggenheim wearing a pair of earrings made for her by Alexander Calder; 1950s. 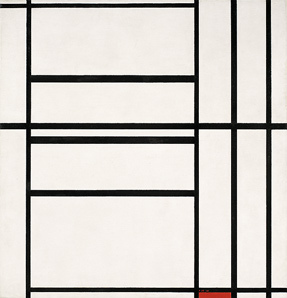 She credits Mondrian with pointing out the value of the work of Jackson Pollock which she did not appreciate at the outset. 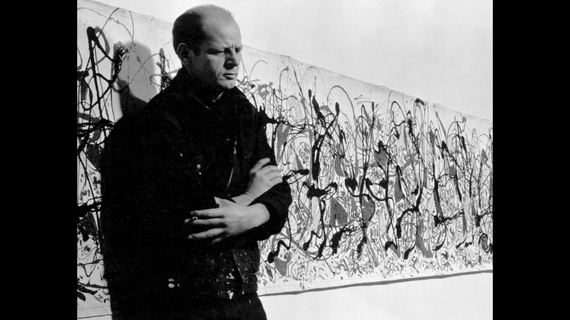 Pollock turned out to be her most important "protégé." 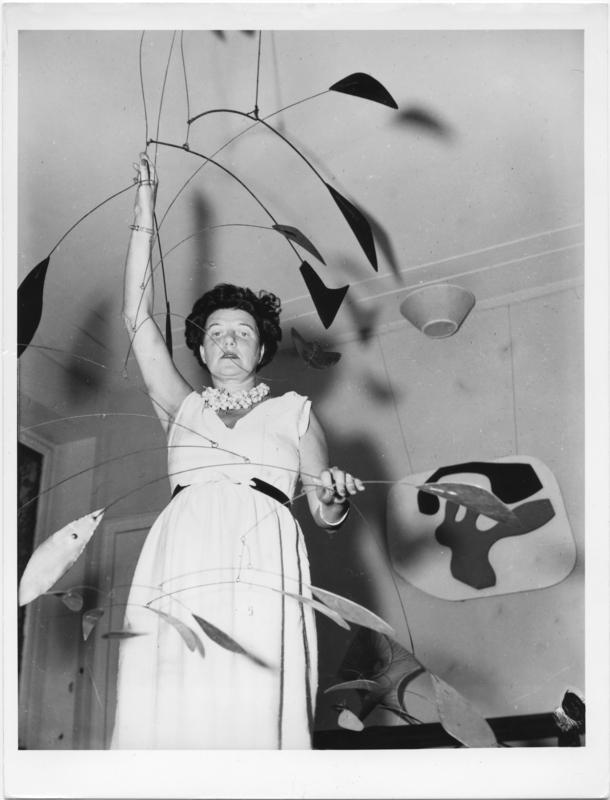 Though Peggy says Pollock and Krasner were both ungrateful after she gave him the possibility of buying a house in the Springs and working in a less pressured environment -- and to get him away from the booze, she understood that this artist had made certain breakthroughs that would alter the course of the history of art. 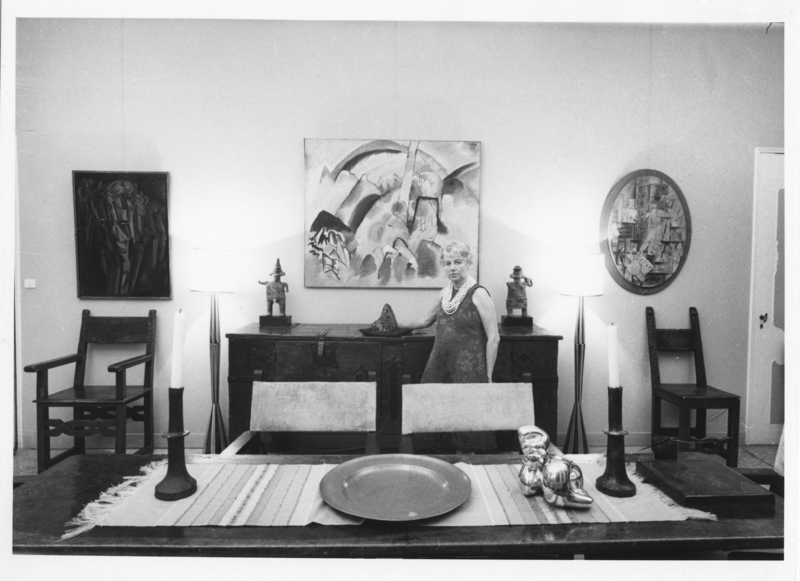 She also had the first show for 31 Women artists (which she later said should have been 30 when she became cross with Lee Krasner) and supported Djuna Barnes, the avant garde author as well as many other artists. Ernst in particular comes off as callow and manipulative -- as Peggy says, she was a waystation between Leonora Carrington and Dorothea Tanning, both artists whom he loved very much. She viewed him as a "baby who was deposited on her doorstep." She got him into the US, married him, supported him, all the while he was running around and devaluing her. Of Ernst it was said, " He once had a Guggenheim but it wasn't a fellowship" When it's quoted to her in the film, she laughs but it is a hollow laugh. "I have always found husbands more satisfactory after marriage than during", she wrote. John Richardson who knew Peggy well in the last period tries to be kind and accurate but one senses right away his only modest admiration for her as a collector as his commentary eventually devolves around descriptions of her Venice villa as being a place for gay cruising and bad meals. 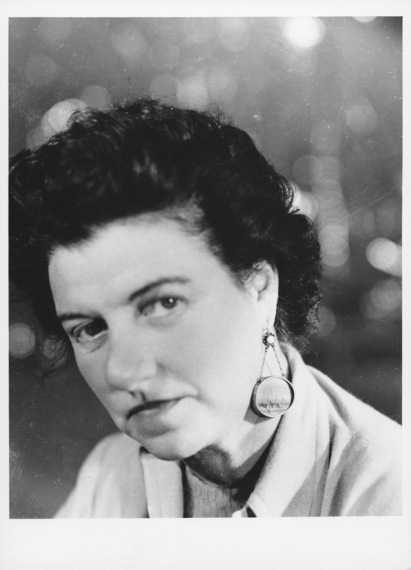 She was even the subject of a most cruel satire by one of the 20th centuries most astute critics, Mary McCarthy, who cast her cold eye on Peggy in her story The Ciccerone. Eventually, Peggy realized instead she would have to create her own reputation for posterity. 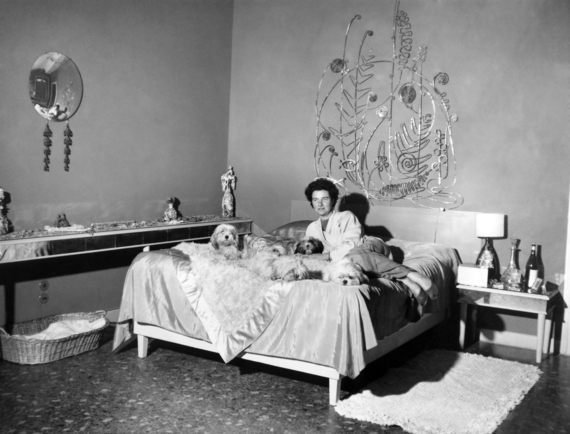 Like the memoirists of today who often reveal TMI, Peggy understood that she would become known as much for the artists she slept with as the art she collected -- though she claimed to have left many one-night stands out of the book. Richardson points out her passion for art served the dual purpose of self-promotion. Would Peggy have had a blog and a twitter handle and filled the pages of Instagram today? Vreeland was quoted in Vanity Fair as saying that "her personal stories have diluted her real accomplishments". She herself however perpetuates this emphasis by dwelling on the sexual peccadilloes with her interview subjects. 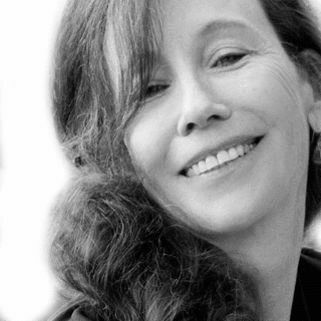 The memoir is more complex, and even if some of it's not altogether accurate, it makes her into a more complete person. A new biography by Francine Prose also adds to the scholarship. In the end Guggenheim seems unhappy and sad, certainly lonely, and certainly taken advantage of just to keep her bed filled, and to feel the attention she so clearly missed as a child or as an attractive woman. She died at 81 apparently fulfilled she had completed her art mission but regretful that she had aged and that men no longer desired her--if in fact they ever had. In the end she looks more like a Jewish gramma despite the op sunglasses she often sported. She had also developed an amphibious talking tic where she stuck her tongue out every so often which did not help her desire to be lovely and beloved. 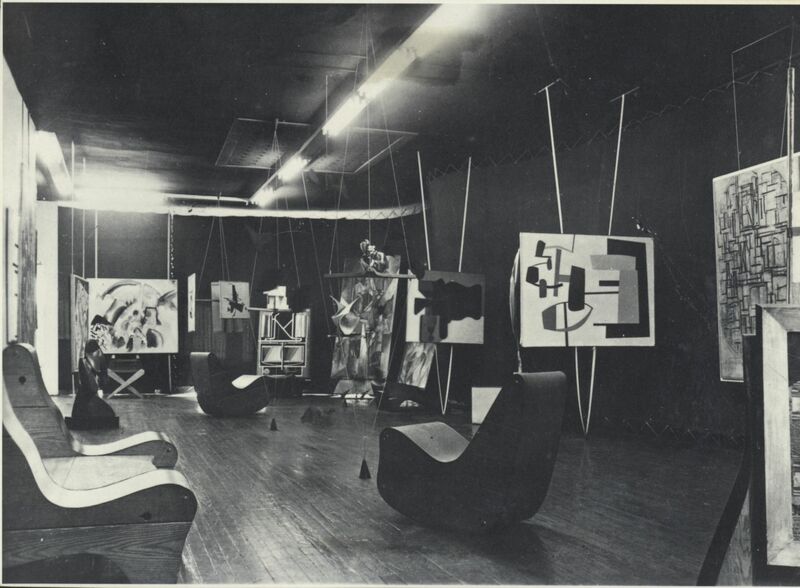 Recently, the ongoing battle between a branch of Peggy's heirs and the Solomon Guggenheim museum resurfaced. 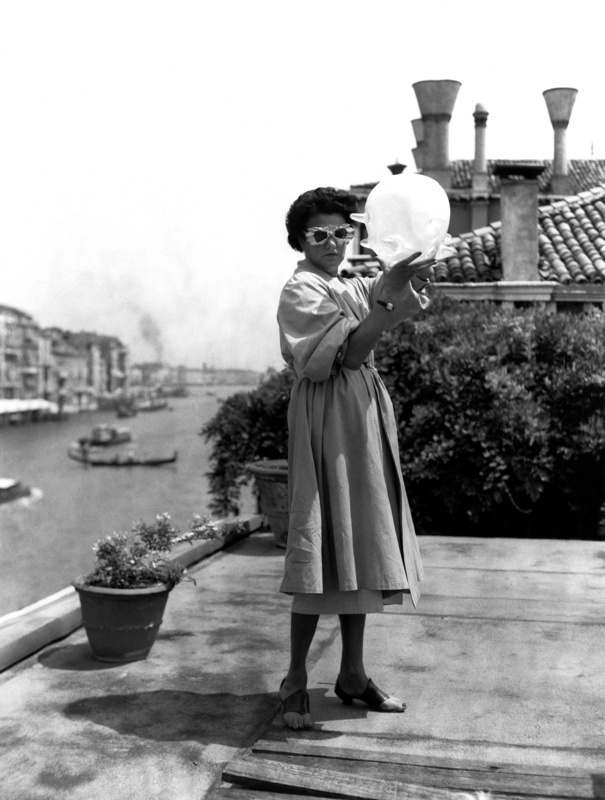 They accuse the museum of diluting the Peggy brand by allowing another collection pride of second place in the Venice museum and clouding the integrity of what she so carefully built up. 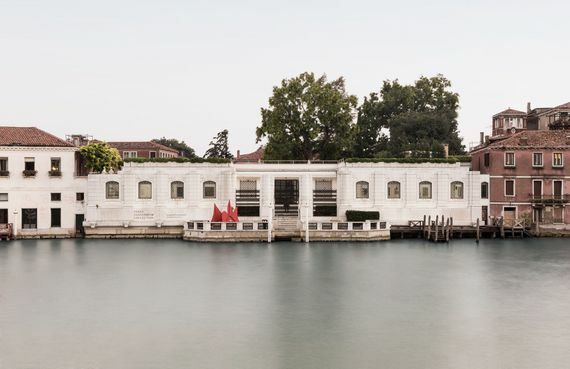 When I went to a reception at the Collection last year during the Venice Biennale, the garden was a seething mass of partygoers with thumping hip hop. I could see how this could be disconcerting. 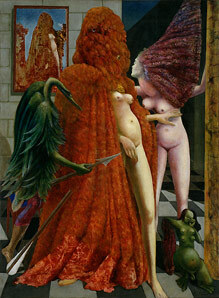 But once inside the main wing, one still had a real sense of how she lived with, and revered, art. That has not gone away. Vreeland apparently had her opening night of her film at Uncle Solomon's museum which Peggy also disdained, (while still also caring about being accepted by her haughty relatives) writing it resembled, " a huge garage...built on a site inadequate for its size....on the wrong side of Fifth Avenue..., the rising ramp, Wright's famous invention, [coiling] like an evil serpent." a patron is not simply a collector who gather works of art for his own pleasure or a philanthropist who helps artists or founds a public museum, but a person who feels responsibility towards both art and the artist together and has the means and will to act upon this feeling. I think we could put her up against any Eli Broad or Stephen Cohen. She relied on her own -- and especially other artists' and scholars' instincts -- rather than dealers. There were no six degrees of separation from the artists to Peggy who just as often slept beside them as hung them on her walls. Why is it that we expect collectors to be scintillating balls of fire in terms of personality anyway? Surely one of the reasons they collect or become patrons is to be alongside more dynamic and creative artists who represent the "other." I loved what Gore Vidal said about her in his introduction to the latest edition of her memoirs. Although she gave parties and collected pictures and people, there was...something cool and impenetrable about her. She does not fuss. She is capable of silence, a rare gift. She listens, an even rarer gift...I began to see Peggy...as the last of Henry James's transatlantic heroines, Daisy Miller with rather more balls. Women were said to have been among the most important buyers of Impressionism (Cone sisters), cubism (Gertrude Stein), Surrealism (Peggy ), American Art (Gertrude Whitney). Are there contemporary patrons who have ambition and an eye like Peggy's? Aggie Gund, Patty Cisneros, Beth de Woody all have been important early patrons of artists' work. They have not started their own galleries or museums but rather have significantly supported other institutions. Cisneros says her online database now rivals that of any permanent collection. Do they have the outlandish personal lives to go along with it? Not so much. The painting at the Biennale (Venice) gets worse every year. Everybody just copies the people who did interesting things 20 years ago....getting more and more stereotyped and more and more boring. 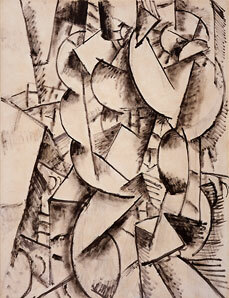 Of course today, paintings are investments, categories that investment houses now define --most literally. I think it has gone to hell as a result of the financial attitude. People blame me for what is painted today because I had encouraged and helped this new movement to be born. I am not responsible...today is the age of collecting, not of creation. Vreeland does not much address this topic in her film. As Vidal wrote, longing for the earlier, Peggy-inflected days of the 20th century, "A world of color and humor...could be entered again if only one had not mislaid the address." To see the film, and especially to read her "Confessions" is to find the address again. 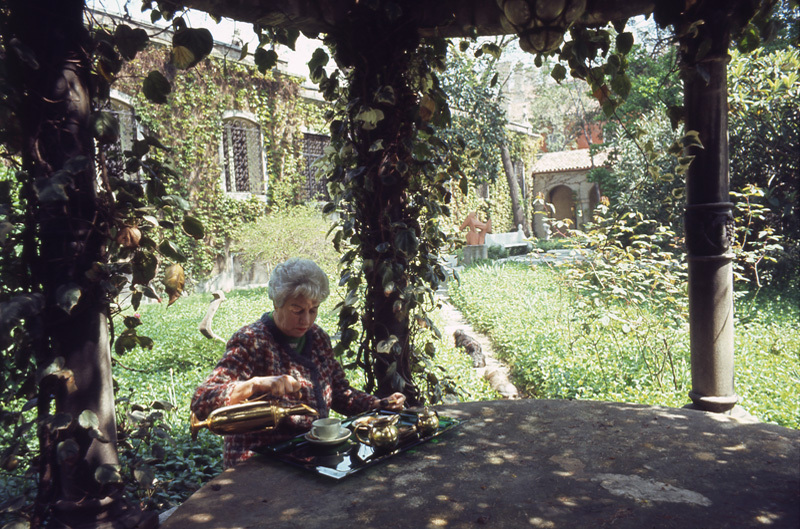 To learn more about the Peggy Guggenheim Collection in Venice go here. To buy the Francine Prose biography or Peggy Guggenheim's memoir, go here. PEGGY GUGGENHEIM: ART ADDICT will open in New York at the IFC Center and Film Society of Lincoln Center's Elinor Bunin Monroe Film Center on November 6 and in Los Angeles at the Landmark Nuart on November 13, with a national roll-out to follow.